Has anyone tried shirataki noodles? I've seen a few bloggers post about these "zero calorie" noodles, which are a chewy, translucent noodle made from japanese yams that can be added to soups and other dishes in place of regular noodles. Even though I'm not on a diet, I was still curious about these noodles so I finally bought a package (the Miracle Noodle brand) so that I could try them myself. A few weeks ago, I had a craving for pad thai. Then I remembered the package of shirataki noodles sitting in my cupboard, and I figured they would be perfect to use instead of the usual rice noodles! The noodles come packaged in a watery solution that can have a very strong "funky" smell, according to other people who have tried them. I was pretty nervous when I opened mine up, but they actually didn't smell that bad, and once you rinse them off, they're quite easy to prepare since they're precooked. To complete my pad thai, I wanted to make it as authentic as possible. 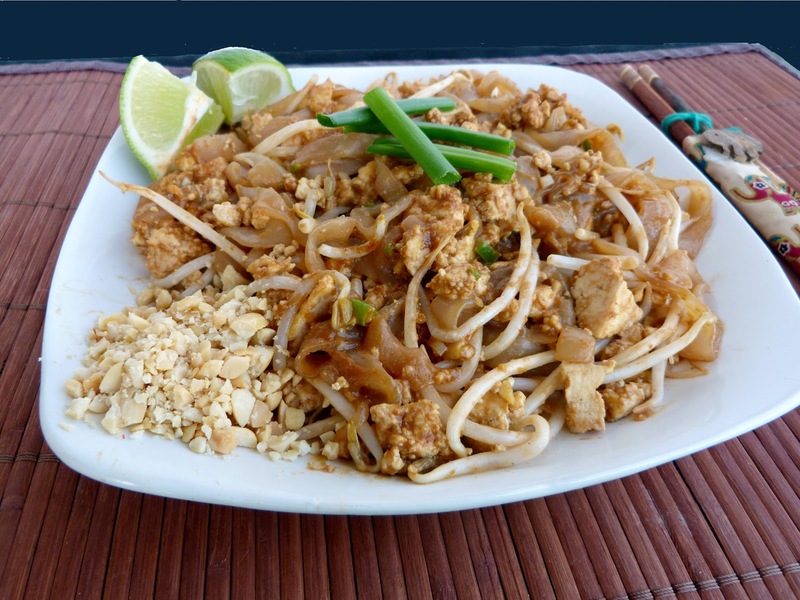 So I thought back to the amazing pad thai I ate in Thailand a couple months ago and tried to remember as best as I could exactly what was in it. I knew it had to have a spicy component from chilies, but since I couldn't find Thai chilies, I just used a jalapeno. I also remembered my pad thai having shallots, bean sprouts and green onions, so I included those as well. And for presentation, the authentic dish that I had was served with lime wedges and a handful of crushed peanuts on the side, which were mixed in to the noodles as you ate, so I tried to replicate that on my own plate. Next came the sauce. I've seen versions of pad thai that use ketchup in the sauce, but I think the real key ingredient to get the pad thai flavour is tamarind paste, which you should be able to find for a cheap price from an Asian food mart. I ended up using this recipe for pad thai sauce but I replaced the peanut flour with peanut butter and used sriracha sauce instead of chili powder. 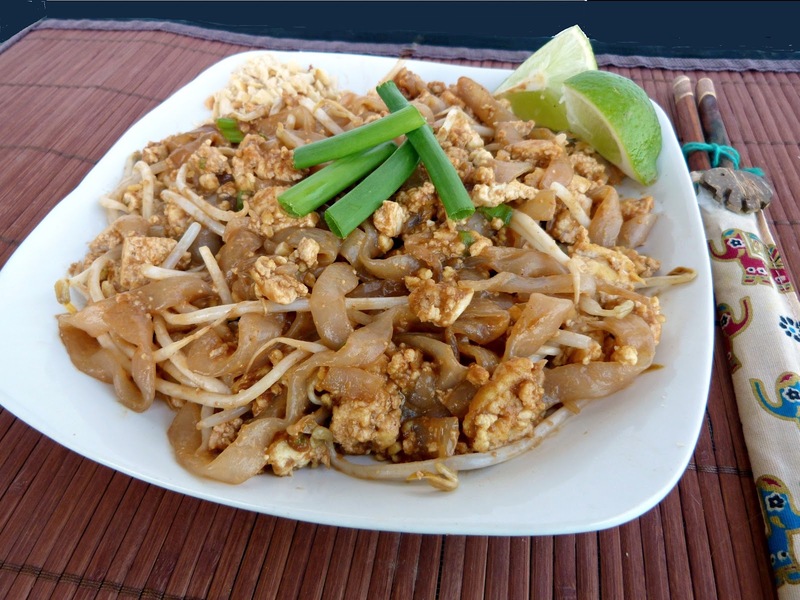 The final component that I would need to create a pad thai that matched the one I had eaten in Thailand would have been to add scrambled eggs to the dish. But since I don't usually eat eggs or have them around, I decided to just leave that part out. But then I came up with a new idea - why not use scrambled tofu instead? I've actually never made scrambled tofu before, but I've seen lots of recipes for it and I knew that the texture and consistency would be very similar to eggs. So I added some crumbled tofu to the pan and stirred it around as you would with scrambled eggs, and luckily, my little experiment turned out perfectly! The tofu had just the right texture that I wanted, and it really soaked up the extra sauce, giving it lots of flavor. 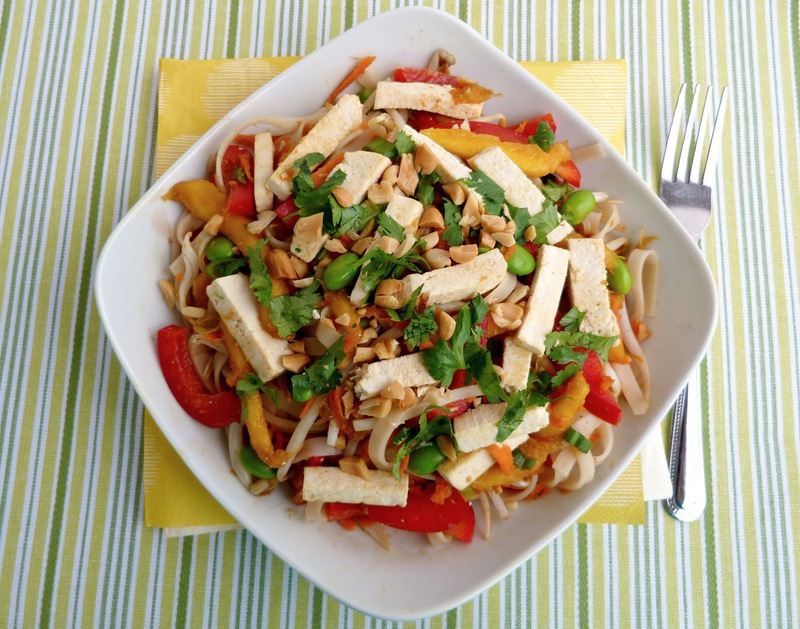 The addition of the tofu also helped give the dish a bit more substance and protein, since the noodles didn't provide any calories or nutrition. 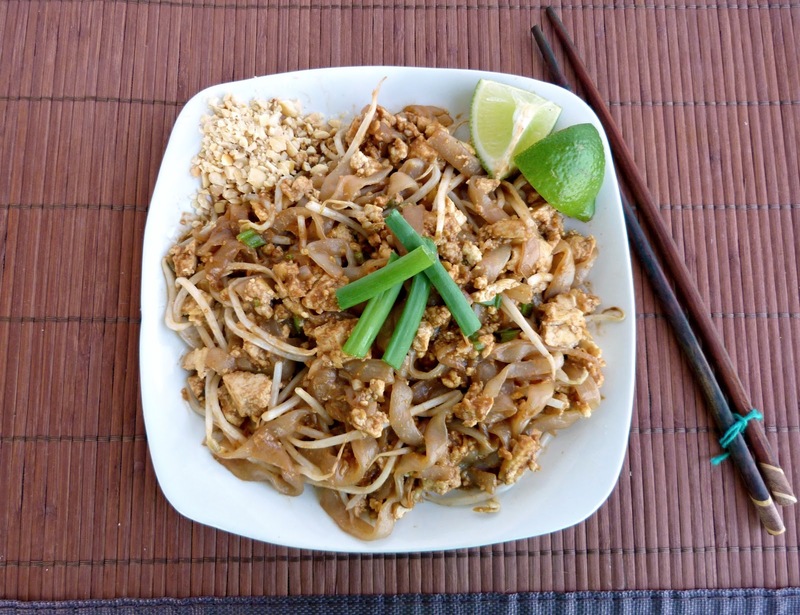 Overall, my vegan pad thai may not have been truly authentic, but I thought the mixture of flavours and textures was pretty close to the original version that I tried in Thailand! I especially loved the extra dimensions of flavour from the lime juice and peanuts, so you definitely shouldn't leave those out! I also really liked the thick, chewy shirataki noodles, but you could easily replace them with rice noodles if you prefer - just follow the cooking instructions on the package. To make the sauce, whisk or stir all ingredients together in a small bowl. Set aside. Drain the shirataki noodles from their package and rinse under cold water. Let the noodles soak in a bowl of water for about 10-15 minutes. Meanwhile, heat the vegetable oil in a large skillet over medium heat. Add the shallots and cook, stirring, for about 1 minute. Add the garlic and jalapeno and cook for another 30 seconds. Add the crumbled tofu and cook, stirring occasionally, for about 5 minutes, until the tofu is softened and lightly browned. (You can leave the tofu in larger chunks, or break it up into smaller pieces using a wooden spoon as you cook). Drain the noodles and add to the skillet. Add the sauce and a splash of water and stir the sauce into the noodles. Once the sauce and noodles are hot, add the green onions and bean sprouts. Stir for about 1 minute, until everything is heated through and coated in the sauce. Transfer the contents to two plates. Garnish each plate with a handful of crushed peanuts and additional bean sprouts if desired. Serve with lime wedges. This was submitted to Wellness Weekend at Diet, Dessert and Dogs. If I had to choose my favourite thing to eat for breakfast, it would probably have to be a bowl of yogurt with sliced fruit and granola. Even though I eat a lot of granola, surprisingly I haven't posted a recipe for it yet on my blog, so I thought it was about time to change that! Typically, what I look for in a granola is a mix of textures and ingredients that tastes good both eaten on its own as a snack, and also mixed into yogurt. My favourite storebought brand of granola right now is Nature's Path Love Crunch granola in their Carrot Cake flavour. I love the combination of the sweet chunks of granola, crunchy pecans, chewy dried pineapple and the yogurt chips. 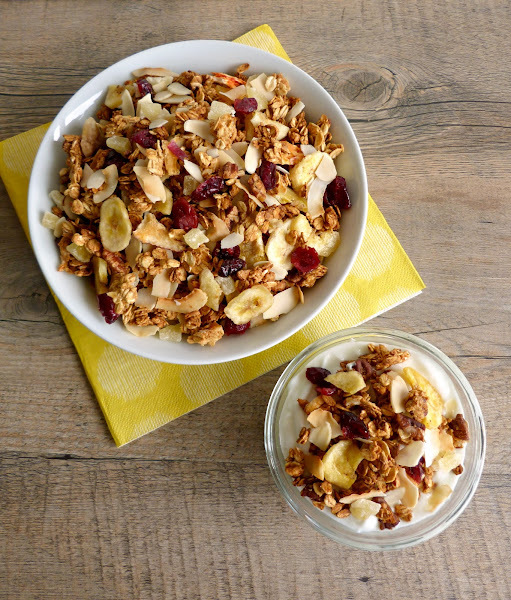 While there are some great packaged brands of granola, they can be a bit expensive. 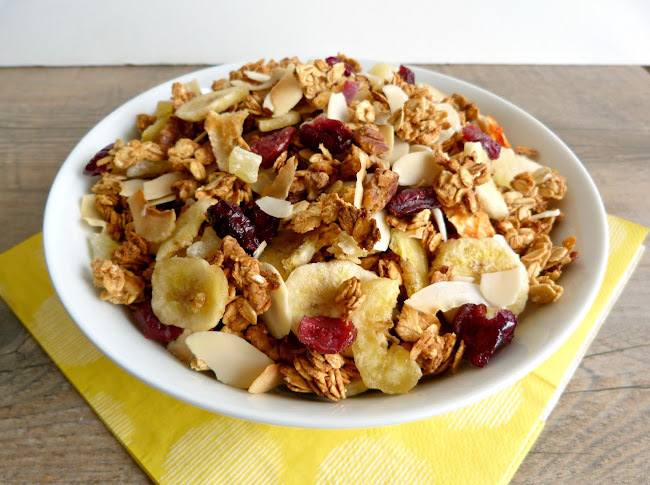 I've learned that it's pretty easy to make your own homemade granola, and the best part is that you can customize it with whatever ingredients you like! Since I love tropical flavors like banana, pineapple, and coconut, I knew that I wanted to create my own tropical granola. I actually decided to make this granola as part of my Mother's Day gift to my mom, who also loves coconut! To get the tropical flavour I wanted, I used four different coconut products: coconut butter (which I made from processing unsweetened coconut in a food processor), coconut nectar, coconut flakes, and coconut extract. I also added dried pineapple and cranberries, banana chips, sliced almonds and pecans. I loved that this granola was chock-full of different ingredients so that every handful or spoonful had something special in it! This was a light and crunchy granola that was a great snack to eat on its own, but I also liked it in yogurt - a thicker yogurt works best. 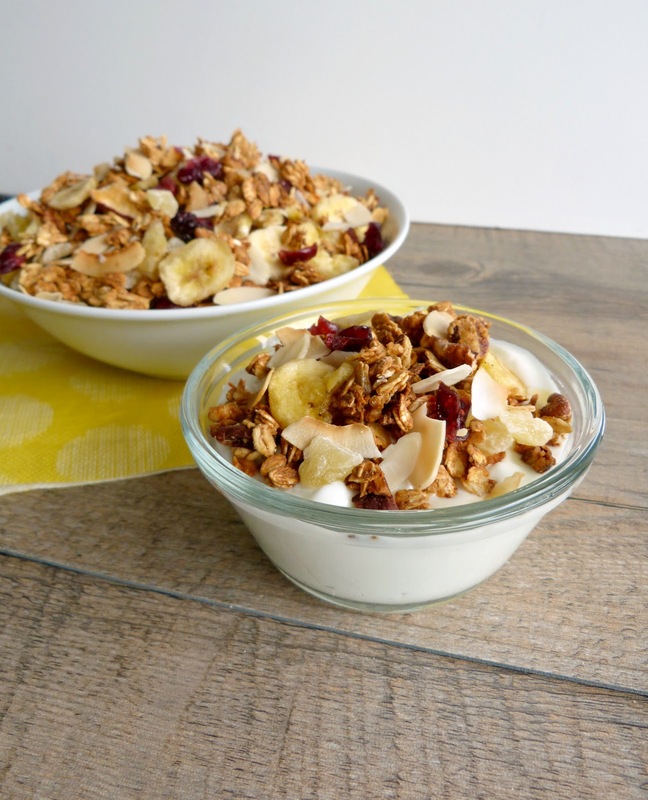 I actually tried it in this Liberte coconut yogurt and it was amazing! Although I didn't get to taste-test much of this granola because I gave it away as a gift, my Mom told me that she really liked it too, and confirmed that the recipe was blog-worthy! Preheat oven to 325°. Line a large baking sheet with parchment paper. Mix the first four ingredients together in a large bowl. Mix the wet ingredients (coconut butter to coconut extract) in a separate bowl, stirring until the mixture is smooth. Add the wet ingredients to the dry ingredients and stir gently with a spatula until all the dry ingredients are coated. Spread mixture onto the prepared baking sheet in an even layer and bake in the preheated oven for 30 minutes, stirring once halfway through. Remove from oven, give the granola one more stir, and add the sliced almonds and coconut flakes. Return to oven for 10-15 more minutes, until the coconut and almonds are lightly toasted (be careful not to burn them). Remove from oven and add the banana chips and dried fruit. Let cool completely before transferring to a container. Today is an official holiday here in Canada for Victoria Day, and it's also the unofficial start to the summer! With summer comes the start of patio season, BBQ season, and enjoying meals outdoors in the company of friends and family. 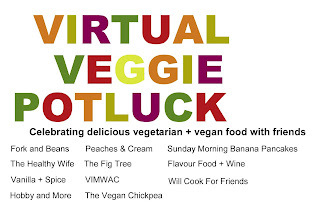 So today seems like the perfect day to have a potluck with some of the wonderful people I've met through blogging! Since we can't all be together in person, Courtney of The Fig Tree blog came up with the idea of having a virtual potluck - that way we can share all of our dishes with each other and with our readers! The rules were pretty simple - we each had to come up with at least one vegan or vegetarian dish that we would "bring" to the potluck, focusing on a spring/summer theme. 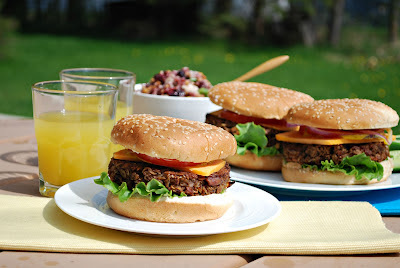 Each of us will post our recipe on our blogs today, and link up to the other participating blogs. For my dish, I decided to bring a traditional potluck item - potato salad, but with an updated and more interesting twist! If you've ever been to a potluck, chances are that somebody brought a potato salad. While there are some good potato salads out there, the majority are not vegetarian or vegan-friendly, since they often contain bacon or sausage and are covered in a heavy mayonnaise or sour cream dressing. In my opinion, the worst offenders are those containers of gloop from the grocery store deli section - I'm sure there are some people who love those potato salads and I've eaten them in the past too, but to me it's not a real potato salad if you can't even distinguish the pieces of actual potato in it! For my potato salad, I used mini red potatoes that I boiled and diced into bite-sized pieces. 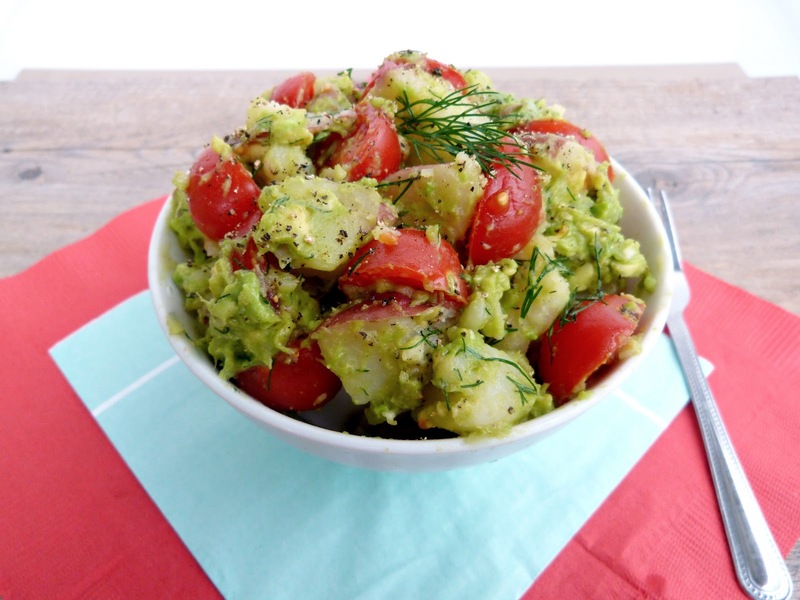 I tossed the potatoes with bright red cherry tomatoes and garlic, and lots of fresh lemon juice and dill to brighten it up. Finally, I mashed a ripe avocado and mixed that into the salad so that everything became coated in a thick layer of avocado dressing. I loved how creamy and filling the potato salad was with the mashed avocado, and the flavours all went so well together! This would be a great dish to make in the summer for those backyard BBQs or potlucks, and I'm sure your guests would be excited to try a new take on the old potato salad! Place the potatoes in a saucepan and cover with water. Bring to a boil and add a dash of salt to the water, then reduce heat to medium and simmer for 15-20 minutes, until potatoes are tender. Remove from heat and drain. Once they are cool enough to handle, cut potatoes into quarters and place in a bowl. Toss with the olive oil, lemon zest, lemon juice, dill, and garlic. Add cherry tomatoes to the bowl and stir to combine. Mash the avocado with a fork (I like to leave it a bit chunky) and add it to the bowl. Stir until the potatoes are evenly coated with the avocado. Season with salt and pepper to taste. Now that you've seen my dish, it's time to check out what everyone else brought to our virtual potluck - just click on the picture to see each post with the recipes! We ended up with a pretty good mix of appetizers, side dishes, main course and dessert...and this wasn't planned, but there also seemed to be a bit of an avocado theme going on! 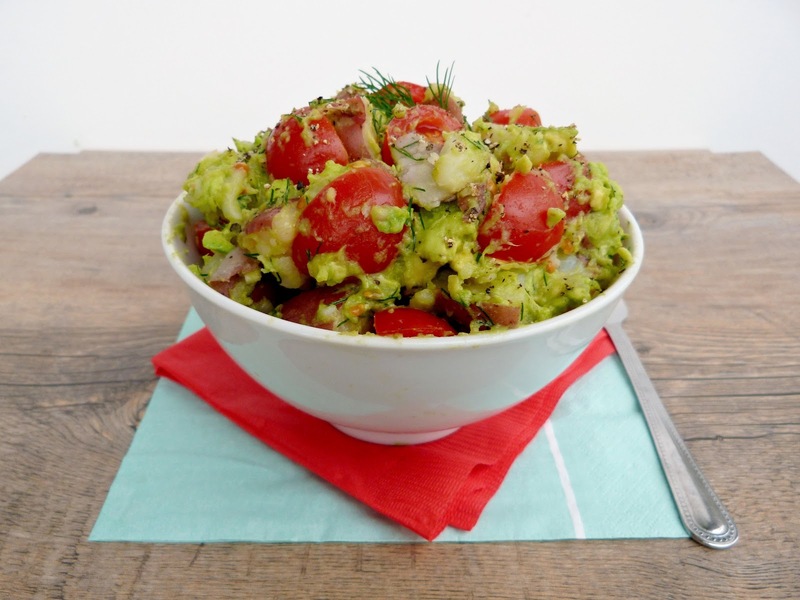 Starting with snacks and appetizers, we have this unique Broccoflower Guacamole from Elaina of the blog Flavour - if you've ever wondered what to do with a broccoflower, try this recipe! 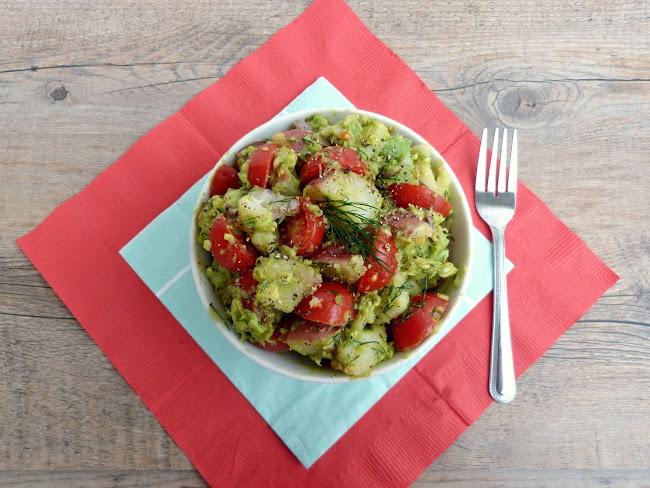 Two people brought beautiful fresh salads with a mix of fruit, veggies and avocado - first up is this Super Green Salad with Strawberries from Caitlin of The Vegan Chickpea with lots of good-for-you green ingredients! 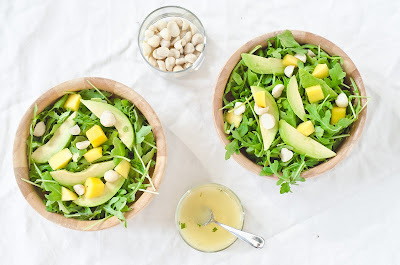 And second is this gorgeous Mango Avocado Salad with Pineapple Mint Dressing from our lovely host Courtney of The Fig Tree blog - I love all the tropical ingredients in this salad! Richa of the blog Hobby and More brought another main course dish full of Indian flavors - these Chard Cauliflower Carrot Wraps with Mint Thyme Tomato Chutney. I would love to eat these wraps for lunch any day, and the mint chutney would have so many other uses too! Next, Destini of The Healthy Wife made another quinoa dish - this Lime Cilantro Black Bean Quinoa Salad - I think it sounds so flavourful and it would be a filling side dish for vegetarians with the beans and quinoa! And of course, what's a potluck without dessert? The dessert options at our virtual potluck sound pretty amazing and feature lots of seasonal fruit...plus they're on the healthy side so you don't have to feel guilty about ending your meal with one of these options! 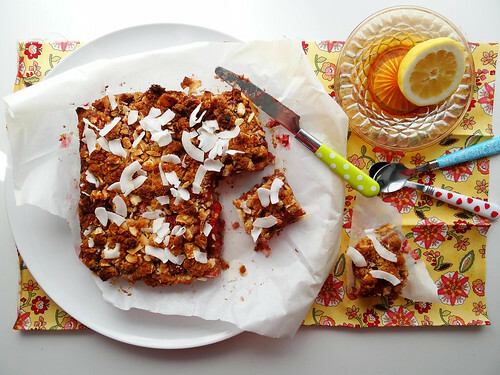 First up for dessert are these Strawberry Rhubarb Coconut Crumb Bars from Heather of Sunday Morning Banana Pancakes - I was immediately hooked after reading the title because I love the combination of strawberries and rhubarb, and adding coconut sounds even better! 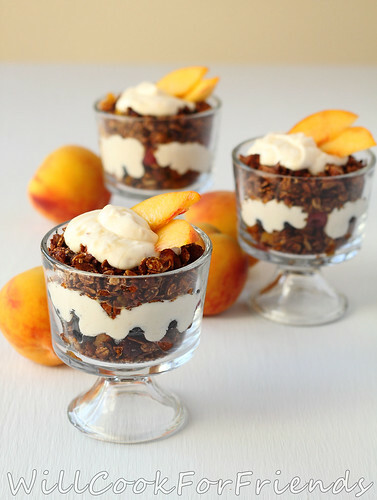 Next, Willow of Will Cook for Friends brought these beautiful Peaches and Cream Granola Parfaits - homemade granola layered with a peach and yogurt puree, topped with peach slices...I would be happy to eat this for breakfast or dessert! Finally, Natasha of the blog VIMWAC (A Vegetarian in Manitoba Without a Clue) brought these Chocolate and Banana Rolled Oat Bites - I love easy no-bake desserts like this, and I'm sure they would disappear quickly at a potluck! Everything looks so good that I wish this was a real-life event so I could try it all! Thanks for joining our virtual potluck and hope everyone has a great week! It's been a while since I've done a roundup of things that I've made and enjoyed lately, so I thought it was about time to do another post of recipes that I've tried from other blogs! I'll start with a recipe that I bookmarked as soon as I saw it because it was so perfect for me - this tahini beet black bread from Sunday Morning Banana Pancakes. As you all know by now, I'm a huge fan of beets and I love discovering new ways to use them! The recipe reminded me of a loaf of bread I tried recently from one of my local farmers markets, which was a soft fresh-baked beet and carrot bread that I absolutely loved. This one wasn't soft and fluffy like the one I had tried before, but had a dense crumb and a solid crust around the outside (although I noticed that my yeast didn't seem to froth very much and my dough didn't rise much, so I might have done something wrong to make it turn out that way). The texture actually worked out well though because this loaf was perfect for slicing, toasting, and spreading with butter and jam. 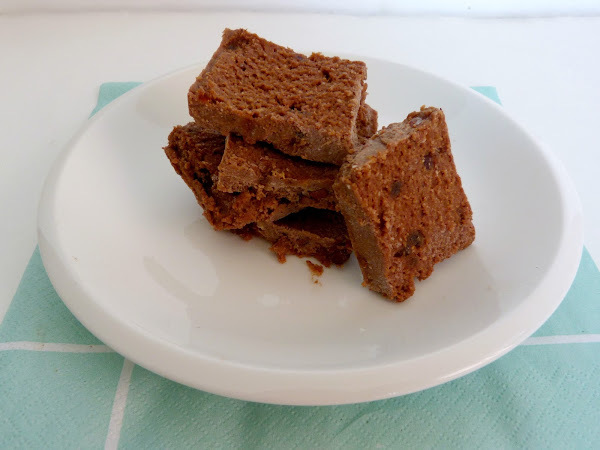 The only changes I made to the recipe were to use carob powder instead of cocoa powder, and I added a 1/4 cup of shredded carrots in addition to the beets. 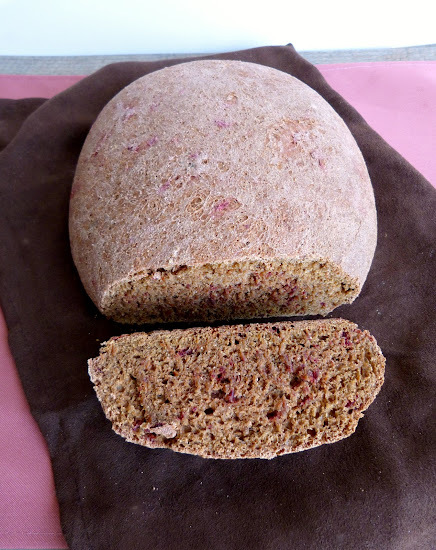 I loved the flavor of this bread - it was so deep, dark and complex from the molasses and carob, and the shredded beets provided a bit of sweetness and some extra texture, not to mention the pink tint they gave to the entire loaf! This was definitely a unique loaf of bread and I'm so glad I tried the recipe! Next up is a snack I made while I was at my parents house recently. 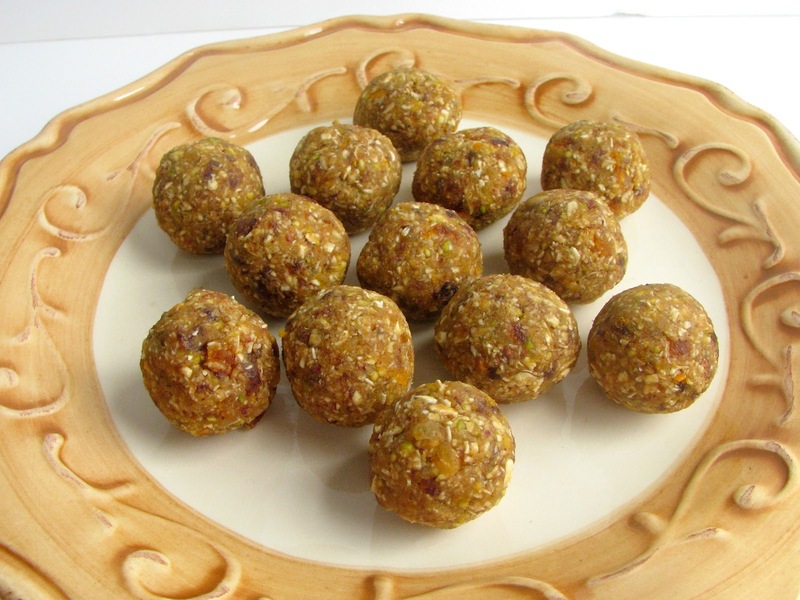 I love trying different kinds of raw energy balls, and this recipe for pistachio, orange and apricot bars from Peachy Palate sounded perfect for my parents' tastes. I usually don't like the flavour of orange zest, but I actually really liked the combination of pistachios, oats, apricots, dates, and orange. I also substituted half of the apricots with dried papaya, which worked really well. My Mom liked these so much that she requested I make them again for an office potluck that she had the next week! You can form them into any shape or size that you want - the original recipe was for full sized bars, but I made bite-sized balls and squares instead. If you read my post last week for this Rhubarb Loaf with Strawberry Jam Swirl, you'll know that I love to eat rhubarb in baked goods and desserts. So I was very curious when I started to see savory recipes using rhubarb. 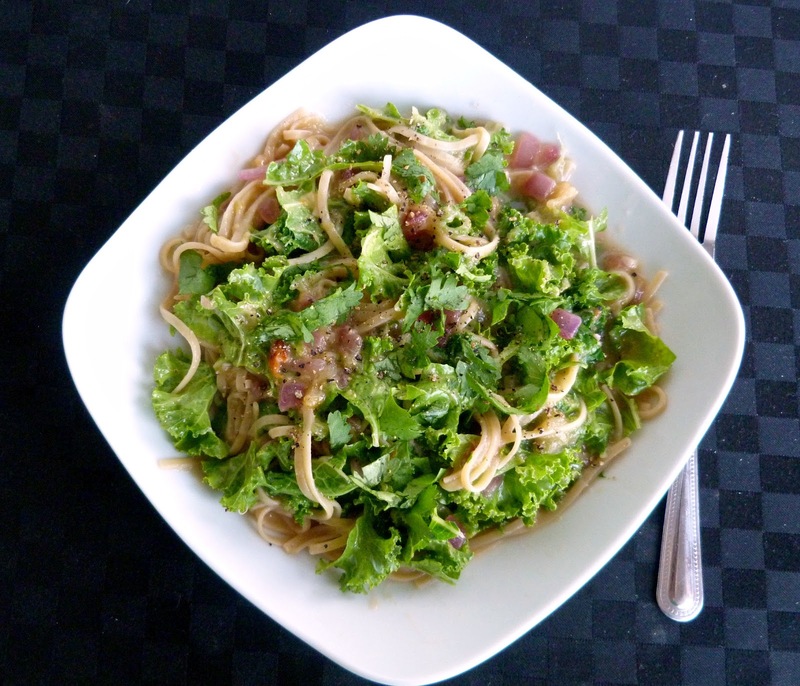 I was pretty hesitant to try rhubarb in my dinner, but I thought this recipe for pasta with kale and spicy rhubarb sauce from Naturally Ella sounded really good. I had some leftover rhubarb to use up anyway, so I decided to give it a try. The recipe was easy to put together, and I loved the rhubarb sauce! It had everything that I like about rhubarb in sweet recipes, but with a spicy twist. This is one recipe that I would definitely make again, and now I want to try more savory rhubarb recipes! And of course, I have a few quick & easy vegan dessert recipes to add to this round-up! Pretty much every recipe that Chocolate Covered Katie posts appeals to me, and they always turn out well when I make them myself. I actually made two of her recipes two nights in a row recently and brought them into the office to share. 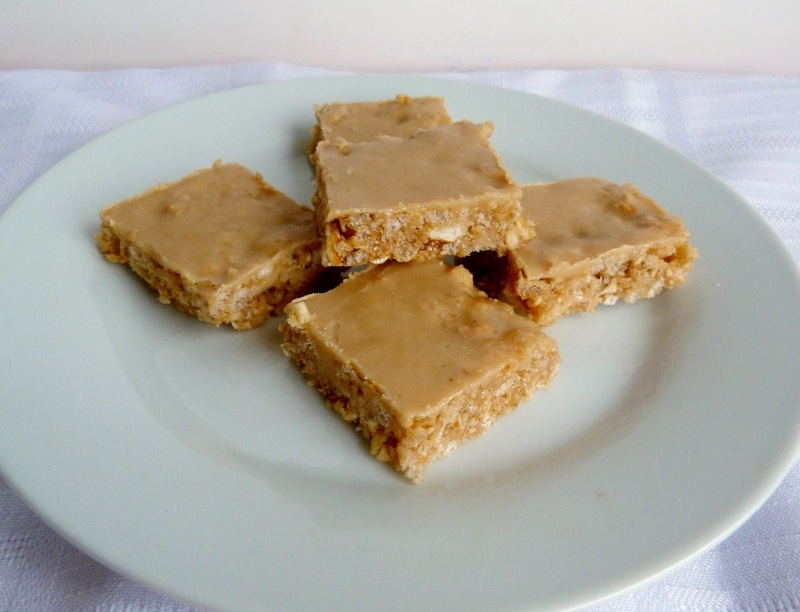 First up was these no-bake peanut butter pretzel bars, which I turned into squares. The sweet and salty combination was so good that I wish I had made a double batch and kept some for myself! The one tip I would give with these is to keep them in the fridge and serve them immediately, because they started to get a bit too soft and melty once they had been sitting out for a while. 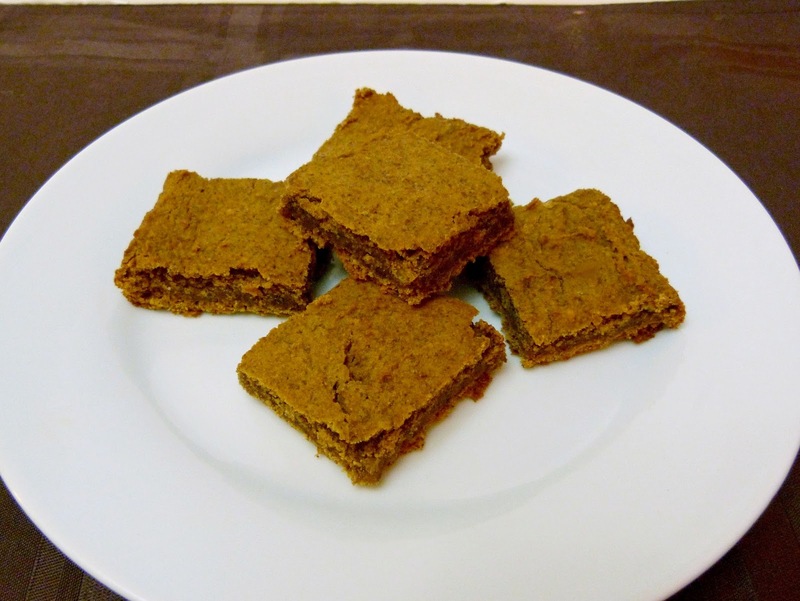 The next day I brought in these snickerdoodle blondies made with chickpeas and almond butter. These are definitely my kind of treat, but I wasn't sure what my colleagues would think about them, but it turned out everyone else liked them too, and they were all happy when I told them how healthy they were! Finally, I can't end this post without sharing my new favourite breakfast: this recipe for coconut mango overnight oats from Oh My Veggies. I don't have a picture of my version, but her pictures are much prettier anyway so click on the link to see it! It's so easy to put together - just combine oats, almond milk, coconut, mango and a touch of sweetener and let it sit in the fridge overnight. Somehow this combination makes the mango taste even better than it would on its own, and it's the perfect cold and refreshing breakfast for the summer. I've already made it a few times recently, and I'll keep making it every time I have a ripe mango sitting around! That's all the recipes I have to share for now...Hope everyone has a great weekend, and that all my Canadian readers enjoy the long holiday weekend! I'm looking forward to the hot weather we're supposed to get in southern Ontario! I don't post a lot of sandwich recipes on my blog because the ones I eat are usually pretty simple, like hummus and veggies on a bagel, tofu salad in a pita, or even plain old peanut butter and jam. Up until now, my favourite sandwich combination was this pumpernickel sandwich with avocado, sprouts and a white bean spread. 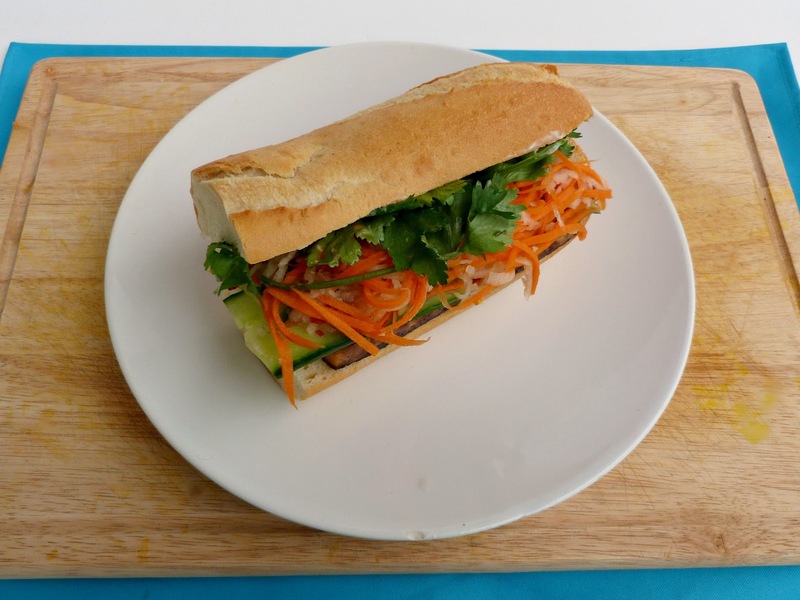 But now there's a new sandwich in town and its ready to take over the number one spot - the banh mi! 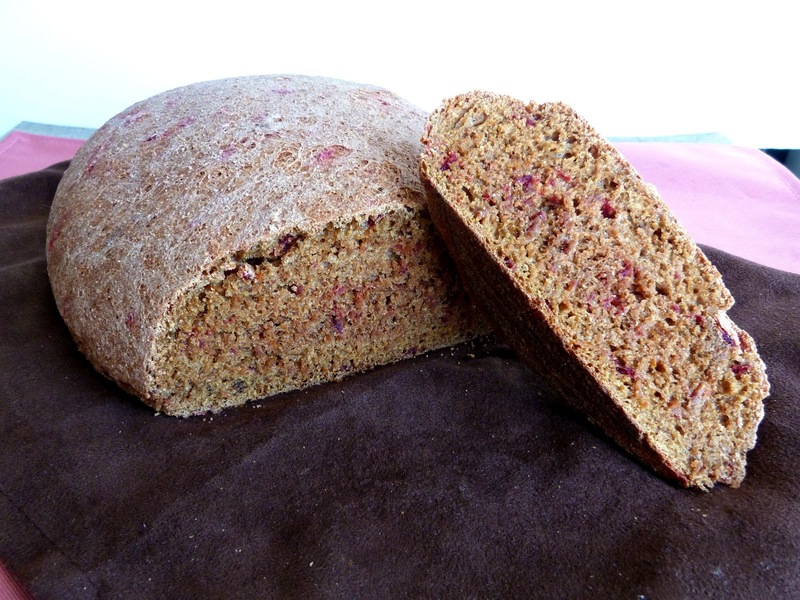 Whereas the pumpernickel was soft, creamy, and comforting, this one is sharp, spicy, and in-your-face! 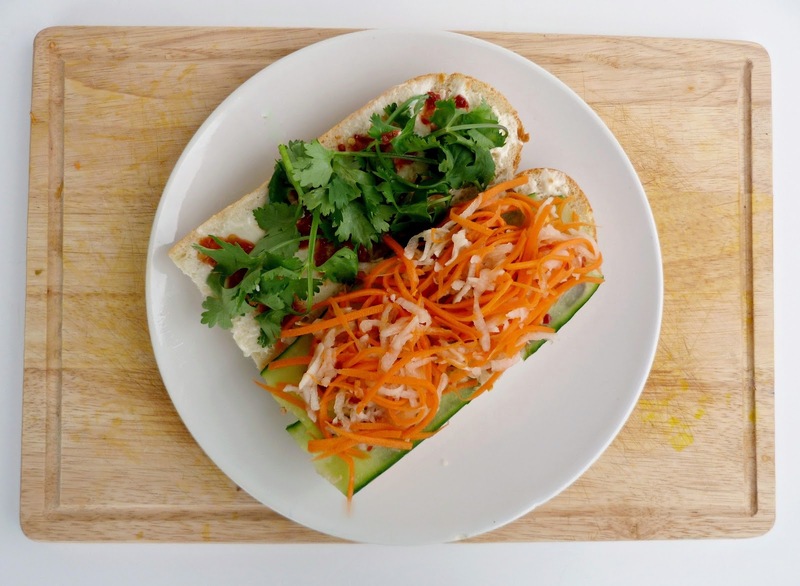 If you haven't heard of banh mi, it's a Vietnamese baguette that is usually made with some kind of meat filling and topped with pickled carrot and daikon radish, cucumber slices, fresh cilantro and a spicy mayonnaise and chili spread. I had seen recipes for both vegetarian and non-vegetarian versions of this sandwich online, but I had never tried one until a few months ago, when I came across a small take-out restaurant nearby that actually specializes in these popular sandwiches. 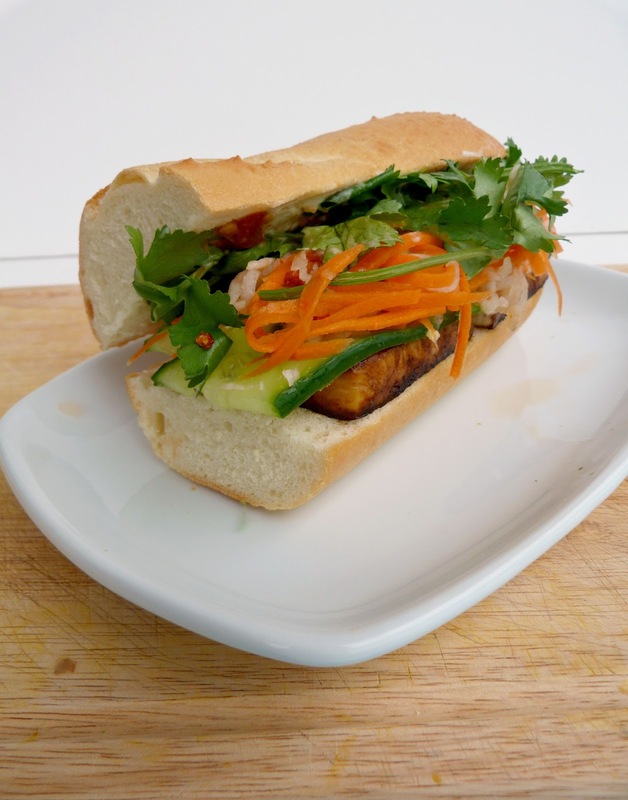 They offered a lot of different kinds of banh mi, and luckily there was one vegetarian option on the menu! I watched as the bun was toasted and spread with mayonnaise, then topped with a layer of tofu, followed by pickled vegetables, and whole sprigs of cilantro. When I got my sandwich home and tried it, I fell in love with the flavour combination. Even though my mouth was on fire from the spiciness, I couldn't stop eating! Ever since then, I've wanted to recreate the banh mi myself. 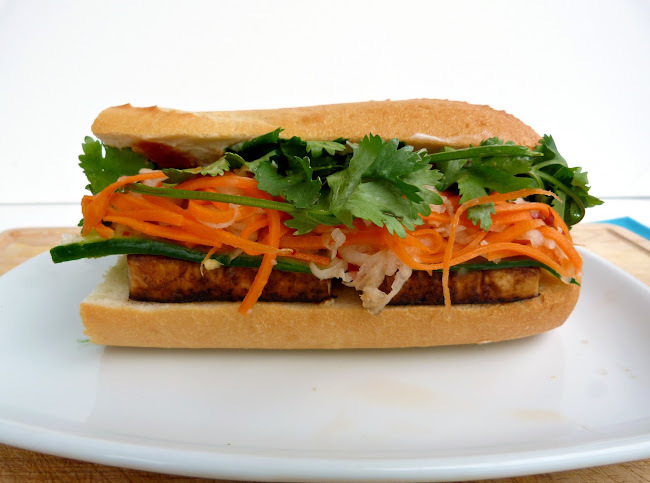 So when I read through the new Vegetarian Times special edition ("Healthy recipes from around the globe") that I received for my birthday and saw a recipe for a tofu bahn mi, I knew I had to make it! Once all the components are ready, you just need to assemble the sandwich and spread on a layer of mayonnaise (or vegenaise) and as much spicy chili sauce as you like! I have to say, I definitely enjoyed my homemade version better than the one I got from the restaurant (as is usually the case with homemade vs fast food). I loved the way each of the flavours played off each other with every bite - the spice from the chili sauce and red pepper flakes, sourness from the pickled veggies, the bite from the fresh cilantro, and even a touch of sweetness. The tofu had a nice texture and really soaked up the flavours of the marinade. This was definitely not your ordinary or everyday sandwich, but it was so refreshing to try a new combination of ingredients and toppings! I made a big batch of each of the components so that I could make a fresh sandwich for dinner three nights in a row, and I enjoyed them just as much each time! Just make sure you use a sturdy bun because you don't want it get too soggy from the sauces - Vietnamese subs would be best if you can find them, but I just used a French baguette from the grocery store. You can also toast the bread before hand, but I liked mine soft - it's up to you! Drain the tofu and slice lengthwise into 1/2 inch thick slices (I used a 12 oz package and got three rectangular slices – enough for three large sandwiches). Press tofu strips between layers of paper towel with a heavy book on top. Let sit for about 20-30 minutes. Mix the soy sauce and ginger in a shallow pan or bowl. 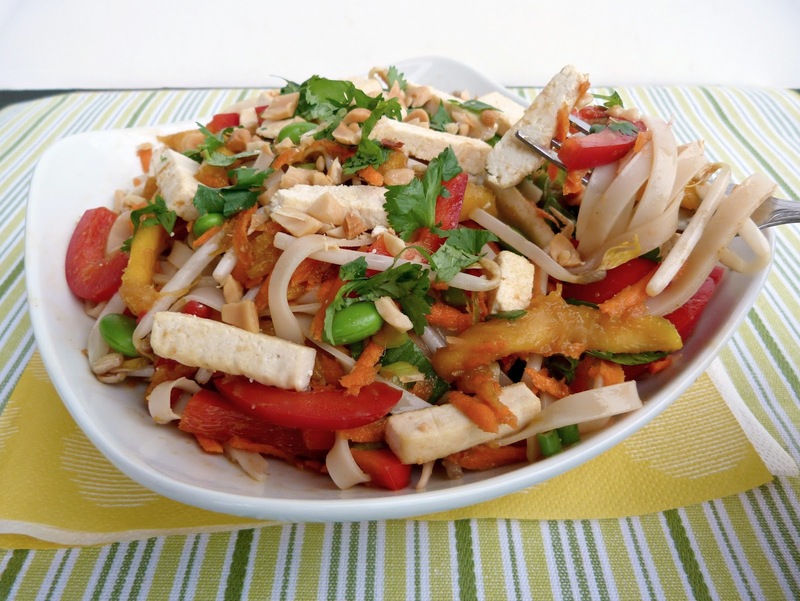 Lay the tofu strips in the pan and let marinate for at least 30 minutes, flipping halfway through to coat all sides. Mix the rice vinegar, salt, sugar, and red pepper flakes in a small bowl and add the grated carrot and daikon. Let sit for about 30 minutes, stirring occasionally. When the tofu is ready, heat the oil in a large skillet over medium heat. Add the tofu and cook for 3-4 minutes per side. Remove from heat and transfer to a paper-towel lined plate. To arrange the sandwich, slice the bun or baguette in half (*Note: you can toast the baguette first if desired by placing it under the broiler for about 5 minutes). Spread the vegenaise on the top half and dot with the chili sauce. Place the cilantro on the top half. Place the tofu slice on the bottom half of the baguette. Lay the cucumber slices over the tofu. Drain the carrot-daikon mixture and place on top of the cucumber. Close sandwich and enjoy! With Mother's Day approaching this weekend, I wanted to bake something special in honour of my Mom, and since she reads my blog, I figured I could share it with her both in person and online! When I think back to my childhood and the treats that my Mom would bake for us, one thing that stands out in my mind is rhubarb. My parents grow a small rhubarb patch in their backyard, which has been there for as long as I can remember. I used to love being assigned the "job" of going out to pick the rhubarb for something my Mom planned to make, and my sisters and I would even eat pieces of it raw, our faces puckering from the sourness. My Mom's specialty was (and still is) her delicious strawberry-rhubarb sour cream pie - every year I look forward to that limited time during the summer when rhubarb and strawberries are both in season because I know I'll get to taste that pie soon! She would also bake the rhubarb into hot fruit crisps and delicious muffins. 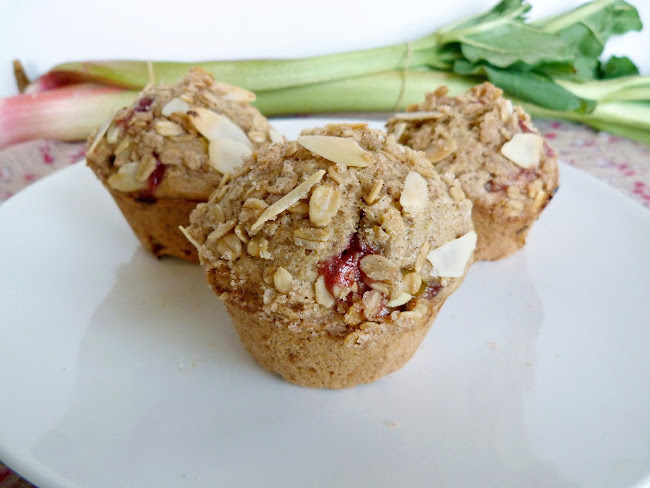 I used to love the days when there would be a fresh batch of rhubarb muffins sitting on the countertop for us to eat as snacks! So it didn't take long for me to decide that my Mother's Day treat this year would be something with rhubarb! I was able to find some at the market last weekend, and I spent the afternoon baking. 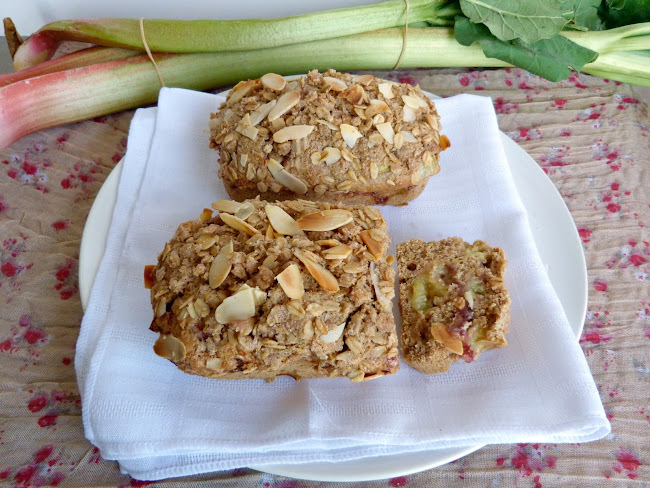 I decided to make mini loaves with the rhubarb because they make such an adorable and perfect sized gift. Plus I could get two loaves from the batter - one for me to eat right away, and one to save in the freezer to bring to Mom this weekend! I found a recipe for vegan strawberry-rhubarb muffins on the Kitchn, so I used that as a guide but turned it into mini loaves. Some of the other changes I made were using coconut oil instead of canola oil, adding some oat flour to the dry ingredients and I changed the spices by replacing the cardamom with cinnamon and adding some ground ginger because I love the combination of rhubarb and ginger. I also left out the strawberries but I still liked the idea of combining the rhubarb with strawberries, so I added a swirl of strawberry-rhubarb jam to the batter instead. Finally, I created my own topping for the loaf by mixing oats, cinnamon, cane sugar and sliced almonds with a bit of Earth Balance Coconut Spread to make a delicious crumble. I divided the batter up and started by filling one mini loaf tin. When that was done, I made one more mini loaf and had enough batter leftover for four large muffins too. As the loaves and muffins were baking, my whole apartment started to fill up with that amazing smell that I remember from my kitchen growing up, so I knew I was off to a good start! 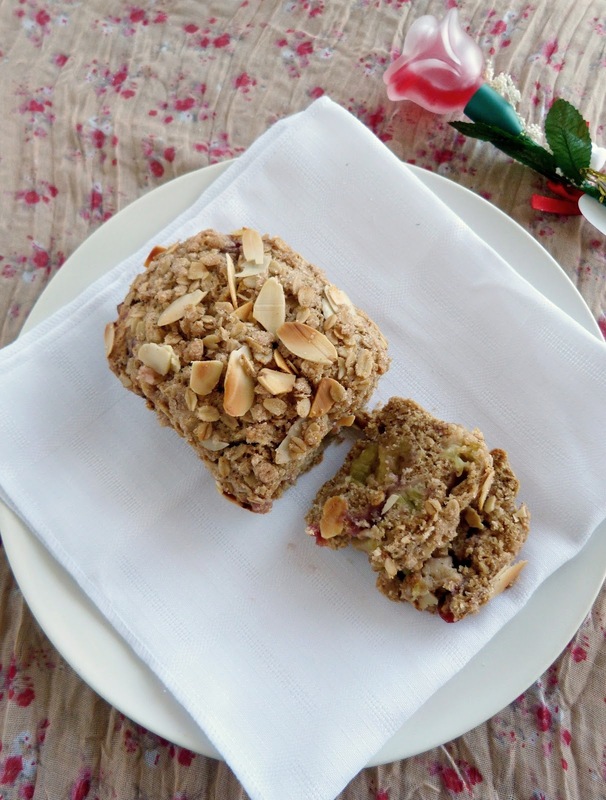 So if you're looking for an idea for something special to treat your mom this weekend, I think she would love this rhubarb loaf! 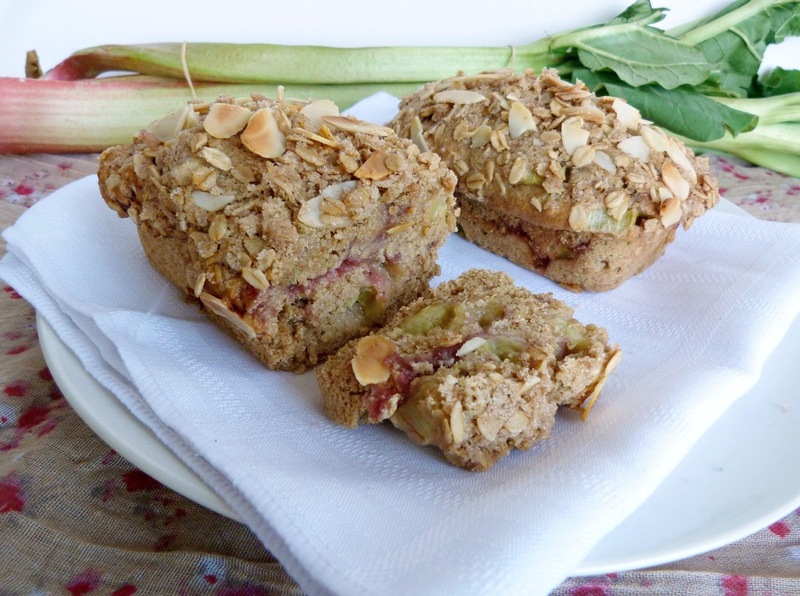 Or even if you just want a treat for yourself or you need ideas for using up your rhubarb, give this recipe a try - you could use it to make muffins, mini loaves or even a regular sized loaf - just adjust the cooking time accordingly. Preheat oven to 400°. Spray a muffin tin and/or mini loaf pans with cooking spray. Mix the almond milk with the vinegar in a small bowl and let sit for 5-10 minutes. In a large bowl, whisk together the dry ingredients (flours through to salt). Add the diced rhubarb and stir until the rhubarb is fully coated. Add the sugar, coconut oil and vanilla to the bowl with the almond milk and vinegar. Stir to combine. (Note: If your almond milk is still cold, it may cause the coconut oil to harden. If this happens, place the mixture in the microwave and microwave in 30 second intervals until the coconut oil is melted again). Add the wet ingredients to the dry ingredients and stir just until the dry ingredients are incorporated. In a separate bowl, combine the oats, sugar and cinnamon for the topping. Add the Earth Balance and mix in using a fork, until it is broken down and the oats are moist and crumbly. Stir in the almonds. Pour the batter into your prepared pans – I filled two mini loaf pans and 4 muffin cups. Fill each pan/muffin cup only halfway at first, then add a spoonful of jam – about 1 tbsp per mini loaf pan or about 1 tsp per muffin cup. Add the remaining batter on top, then swirl with a toothpick to distribute the jam. Sprinkle the topping mixture on top of the batter and press in gently with your hands to help it stick. Bake in the preheated oven for 20-25 minutes for muffins, or 25-30 minutes for mini loaves (I didn't test a large sized loaf but it would probably need around 45-55 minutes). Remove from oven and let cool in the pan on a wire rack for 5-10 minutes. Remove from pan and let cool completely on wire rack. As I've mentioned before, one of my favourite things to make over the past year has been quinoa because I find it so easy to work with and there's so much you can do with it! 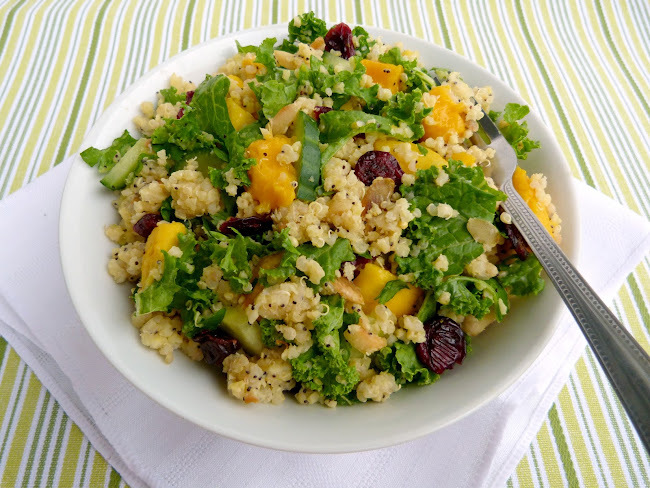 I can always throw together a quick and easy quinoa salad using whatever ingredients I have in the fridge and pantry and the leftovers make a great lunch to bring to the office too. Lately, I've been hearing more about other grains like barley, buckwheat, farro, and kasha. I haven't ventured into cooking with any of those yet, but I'm working my way there! As a first step, I bought a small amount of millet from the bulk bin recently and I've used it in a couple of salads. Millet is a small grain that looks like tiny yellow beads and it can be prepared in the same way as quinoa. I haven't tried it on just its own yet, but I've discovered that cooking a combination of millet and quinoa together makes a nice fluffy, thick mixture that is a great base for a variety of fruits and veggies! 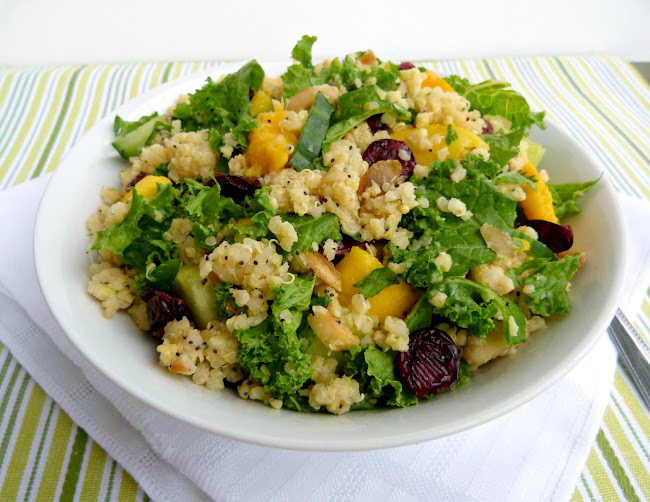 My favourite millet creation so far is this mango millet and kale salad that I adapted slightly from the blog Healthful Pursuit. I made a few changes to the recipe, like using kale instead of spinach because I thought the kale would hold up nicely for leftovers. I also left out the onion and added some diced cucumber, pepitas and cilantro in addition to the mango, almonds and cranberries. I loved the combination of the sweet fruit and fresh cucumber with the soft millet and crunchy almonds. The best part about this salad though was the lemon poppyseed dressing - it was the perfect balance of sweet and tangy and went so well with the rest of the ingredients. I also liked the way the poppy seeds dotted each grain of millet! This salad is a nice light and fresh dish that's perfect for Spring. It's also a great recipe to make a big batch of and then store the leftovers in the fridge to bring for lunches throughout the week, since it keeps well (as long as your mango isn't already overly ripe). I actually have a potluck lunch coming up next week with the theme of "Spring Fling", so this would be the perfect dish to bring! 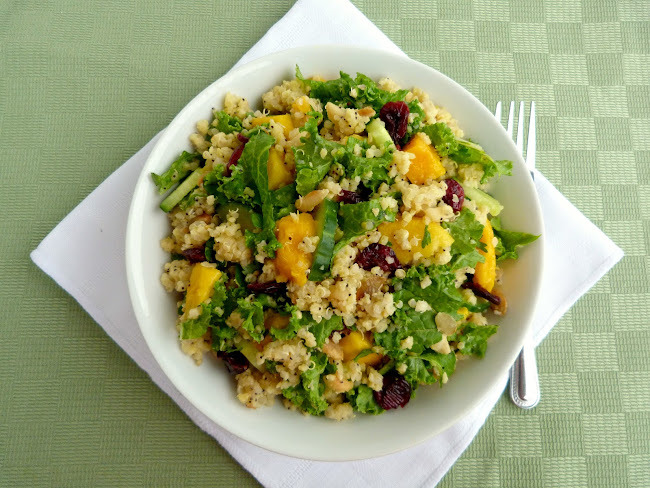 And for more tasty and gluten-free salad ideas, check out this round-up from Healthful Pursuit, where I got this recipe! Combine the millet, quinoa and water in a small saucepan. Bring to a boil, then cover and reduce heat to low. Simmer for 10-15 minutes, until the water is absorbed. Remove from heat and let sit for 10 minutes, then remove lid and fluff with a fork. Place in a large bowl and set aside. Meanwhile, prepare the kale, cucumber and mango and set aside. Prepare the dressing by whisking all the ingredients together in a small bowl. Heat a small skillet over medium heat and add the almonds and pepitas. Toast for a few minutes, until the nuts are lightly browned and fragrant. Transfer to the bowl with the millet mixture and stir to mix. Add the kale to the millet while it is still warm and stir to mix thoroughly. Next, pour the dressing into the bowl and stir again (you can even use your hands to massage the dressing into the kale if you want it to be a bit softer). Add the cucumber, mango, cranberries and cilantro and toss to combine. Chill in the fridge, or serve at room temperature. Makes 3 large servings, or more as a side dish. This was submitted to Wellness Weekend at Diet, Dessert, and Dogs. Hope you're all having a great weekend and enjoying the warm weather! Yesterday morning I walked to the farmer's market and picked up my usual fruits and veggies. This was the first time this year that the market was held outdoors, and also my first sighting of local radishes and rhubarb, so I was sure to pick those up! 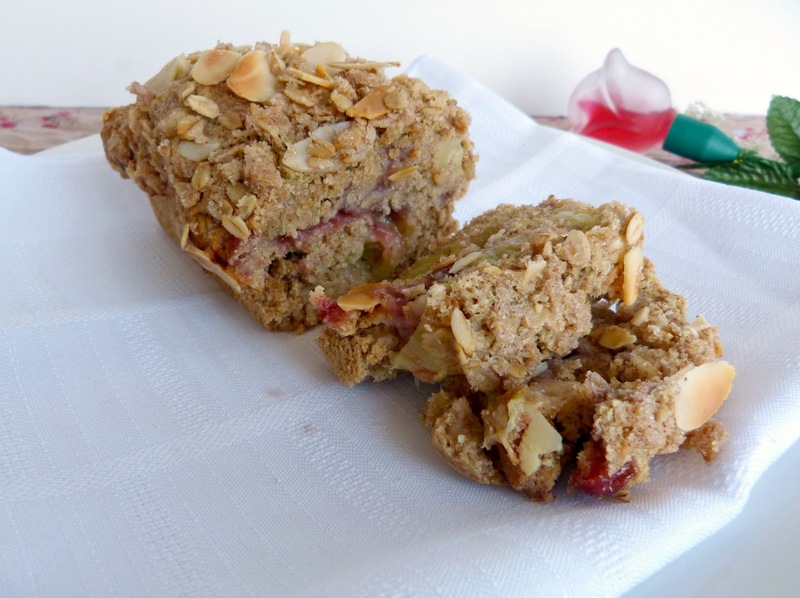 I've already made one recipe with the rhubarb that I can't wait to share! After my shopping, I hung out upstairs at the market where they were having some Cinco de Mayo festivities. I listened to some songs and sat in on a free Mexican cooking class where the chef showed us how to make salsa and a roasted red pepper soup in a pressure cooker - both of which were very fresh tasting and definitely had some heat to them too! I'm looking forward to getting outside in the sun again today, but first I have a recipe to share with you! I actually made this hummus a few months ago when it was still winter. I loved the bright citrusy flavor but I thought it was more suitable for springtime, so I've been saving the recipe until now! 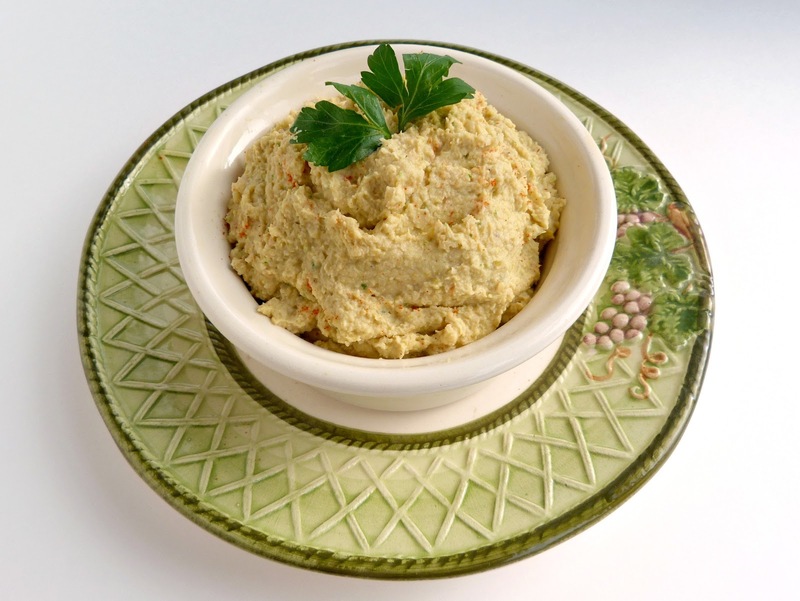 Along with the standard hummus ingredients of chickpeas, tahini, olive oil, garlic, salt and pepper, this recipe includes marinated artichokes, fresh lemon juice and zest, a bit of parsley and some spices. I love the combination of artichokes, chickpeas and lemon in other dishes, like one of my favourite salads, so I knew that I would love these flavours together in a hummus too! The lemon and artichokes both provided a nice amount of acidity to the hummus, and the spices and parsley added more layers of flavor. This was also one of the creamiest hummuses I've ever made - the secret is adding some of the chickpea liquid and artichoke liquid at the end. This would be a nice snack to serve with crackers, pita chips, or any other dippers that you like. This was definitely a big hit in my house, so if you have a potluck or picnic coming up, this hummus would be a great item to bring! Adapted from What's Cookin' Chicago? Place all ingredients except for the artichoke and chickpea liquids in a food processor and process until everything is fully broken down and mixed together, scraping down the sides of the bowl if necessary. Add the artichoke liquid and 1 tsp of the chickpea liquid and process until it is incorporated. 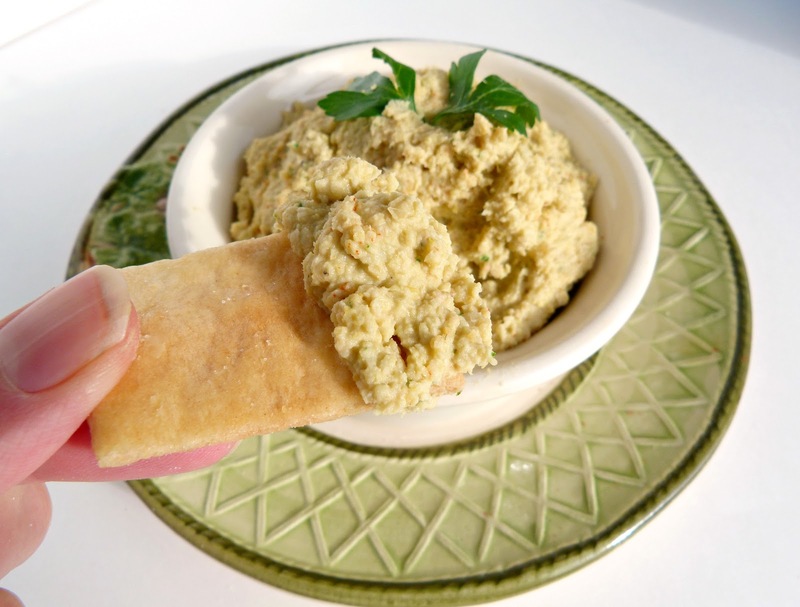 If the hummus looks like it needs a bit more liquid, add the remaining teaspoon of chickpea liquid and process again. Taste and adjust seasoning if desired. 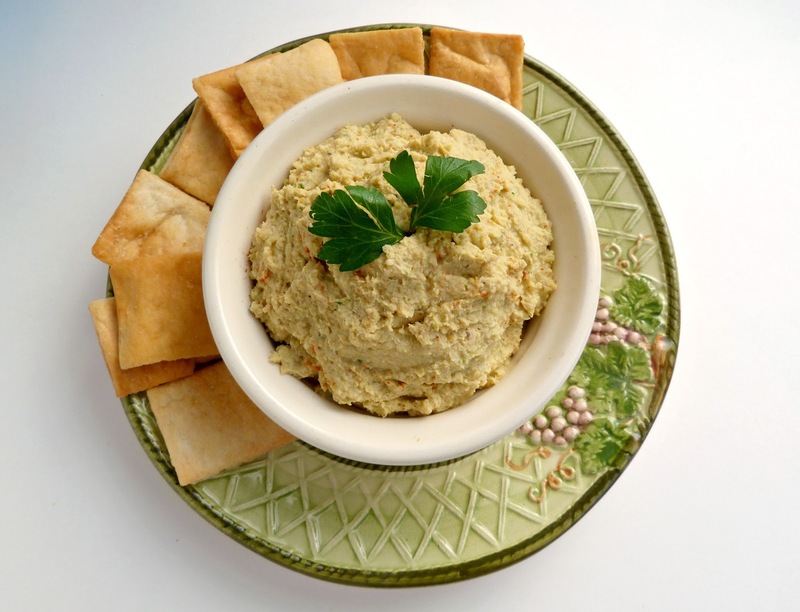 Serve with veggies, pitas, or crackers. Store in the refrigerator. This was submitted to Wellness Weekend at Diet, Dessert, & Dogs.